A group of computer science students from Mississippi State University’s Bagley College of Engineering recently participated in Hack the Future: Between Earth and Sky, a local hackathon sponsored by the Mississippi Band of Choctaw Indians. 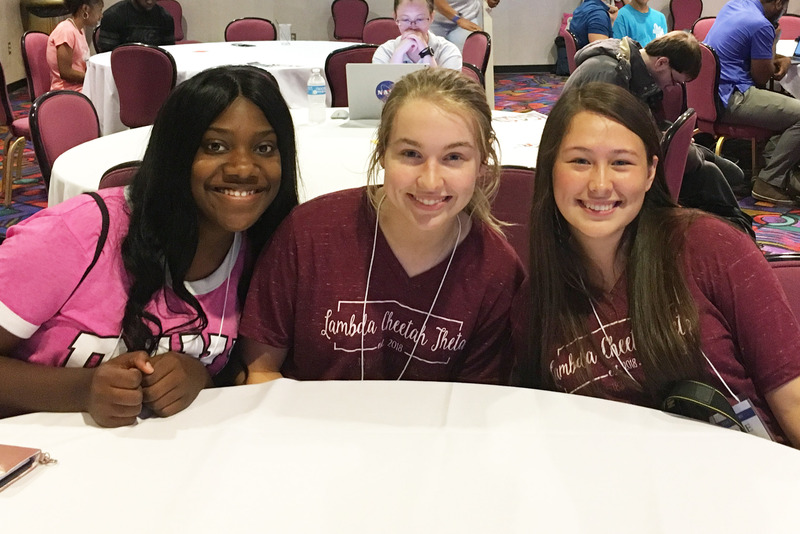 Bagley students (from left) Darrah Phillips, Tara Broome and Nicole Mejia participated in a hackathon hosted by the Mississippi Band of Choctaw Indians. Jesse Ables, a graduate student in cyber security from Flora, Mississippi, was part of the second-place team that developed a way to use thermal imaging to map underground utilities. Tara Broome, an entering freshman in computer science from Madison, Mississippi, was part of the third-place team, who tackled the problem of monitoring underground gas tanks. In addition to Ables and Broome, Mississippi State computer science & engineering students Patrick Boudreaux, Nicole Mejia, Lauren Orsini, Darrah Phillips and Christen Poole, as well as chemical engineering student Dalton Pruitt, participated in the hackathon. Lee also serves as director of the Golden Triangle campus of the Mississippi Coding Academies, which saw several students participate in the hackathon. MCA students Kingdom McGee and Slater Borcher were on the team that captured first place while MCA students Angela Pugh and Kayla Woodard were on the third-place team. Also competing from the Mississippi Coding Academies were Leigh Jones (Golden Triangle campus) and five students from the Jackson MCA location: Willie Washington, Nekiedra Singleton, Rockmon Allen, LindseyLewis, and Aaron Smith. Nine teams competed in the hackathon, which began with speakers from the MBCI Public Works department sharing real-world challenges they face in their daily work of keeping the Reservation’s public infrastructure and services running smoothly. Participants then imagined solutions to these challenges and developed concepts to tackle the issues in a practical way. Mississippi State’s Bagley College of Engineering was a co-sponsor of the event.